D.C. voters will make their picks in council and other contests Tuesday and decide whether to gradually get rid of the alternate minimum wage for tipped workers. Polls will be open from 7 a.m. to 8 p.m., and D.C. allows same-day registration. It is a closed primary, though the only Republican running for D.C. Council, in Ward 6, is unopposed. 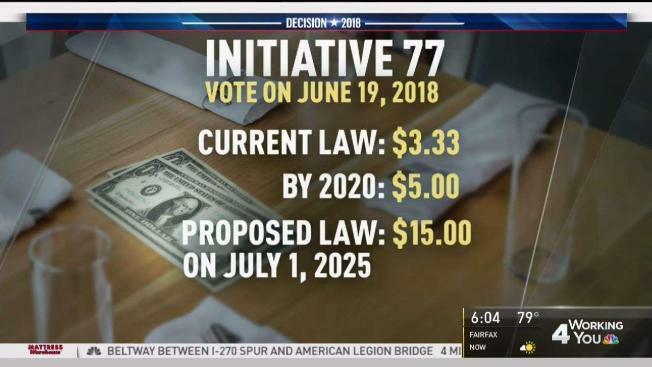 Initiative 77 would require restaurants to raise the minimum wage to $15 for tipped employees. News4's Jackie Bensen reports. Democrats and Republicans can vote on whether to create a flat minimum wage for all D.C. workers. Those in favor of Initiative 77 say it will protect vulnerable populations from discrimination and harassment. Those against it say the law could end up lowering wages and put restaurants out of business. D.C. has been hiking its minimum wage since 2014, and it will continue to rise to $15 by 2020. The minimum wage in D.C. is currently $12.50, but tipped employees are exempt and paid just $3.33 hourly. Under the current law, if tipped employees don't earn minimum wage with their tips, their employers are required to pay the difference. A 2017 D.C. Department of Employment Services' Minimum Wage Economic Impact Study found more than 27,000 employees in D.C. work for tips. More than half of those employees are not waiters or bartenders; they're hostesses, parking lot attendants and salon employees. An audit by the department found 419 cases of employers violating the law requiring employers to pay up to minimum wage. 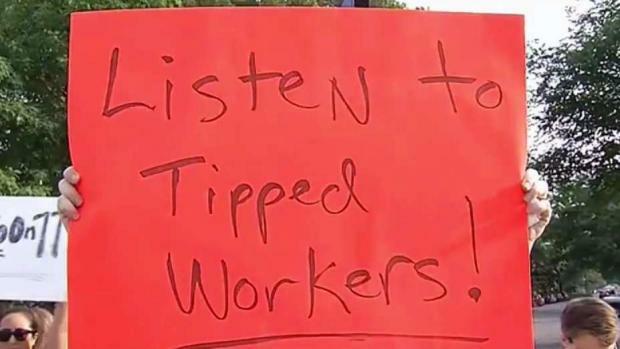 Voters will decide Tuesday whether to raise the minimum wage for tipped workers in the District. Derrick Ward reports on how the measure could affect restaurant workers and others. The initiative would require restaurants to annually raise the minimum wages of tipped employee wages by $1.50 until 2025, when the rate is set to match the $15 minimum wage for non-tipped employees. Advocates in favor of the initiative said employees, especially women and members of minority groups, endure sexual harassment and other inappropriate behavior from customers as they work to make tips. They also argue that the higher minimum wage won't stop people from tipping. D.C. Delegate to the House Eleanor Holmes Norton and Mayor Muriel Bowser should easily win new terms. Norton, 81, has held her office since 1991. She faces challenger Kim Ford. Bowser has two challengers who have not gained much momentum: Ernest Johnson and James Butler. Chairman Phil Mendelson could be in a competitive race with Ed Lazere. Mendelson was first elected in 2012 to fill the term of Kwame Brown, then was re-elected in 2014. Lazere is the longtime director of the D.C. Fiscal Policy Institute, a progressive think tank. Incumbent Anita Bonds is running for re-election for a seat she has held since 2012, when she was first elected to complete Mendelson's term when he became Council chairman. This would be her second full term. The three men running against her have never held elected office: real estate professional Marcus Goodwin, environmental activist Jeremiah Lowery and Aaron Holmes, who has had several jobs in private and public sectors. Incumbent Councilwoman Brianne Nadeau is running for her second term after beating long-time Councilman Jim Graham in 2014. She faces three challengers. Sheika Reid is a local business owner and community organizer who hosted a radio show on WPFW for several years. Lori Parker served as a magistrate judge in D.C. Superior Court for 11 years and was an ANC commissioner for two neighborhoods. Kent Boese managed libraries for the Smithsonian and a law firm and has been an active ANC commissioner. Kenyan McDuffie has represented Ward 5 since 2012 when he won a special election to replace Harry Thomas Jr. who resigned after pleading guilty to felony charges. McDuffie is heavily favored to win but has four candidates running against him: ANC commissioner and attorney Bradley Thomas, LaMonica Jeffrey, ANC commissioner and Army veteran Gayle Hall Carley and Nestor Djonkam, a hospital engineer who has run for mayor twice. Incumbent Councilman Charles Allen is running for his second term after previously serving as director of public policy for the DC Primary Care Association and chief of staff for his Ward 6 predecessor, Tommy Wells. His challenger is Lisa Hunter, a former Peace Corps volunteer who has worked in AIDS/HIV education and held several other jobs in the federal government.